Help! First time Apple IIe user. I just bought an Apple IIe platinum from an antique shop. It turns on and I know that the ROM works because we loaded up a program they had. I brought it home and power it on but can't get anything to happen. I turn it on and get this screen but nothing else works. Please help me figure out how to work this machine. Every video I watch does not have this issue. 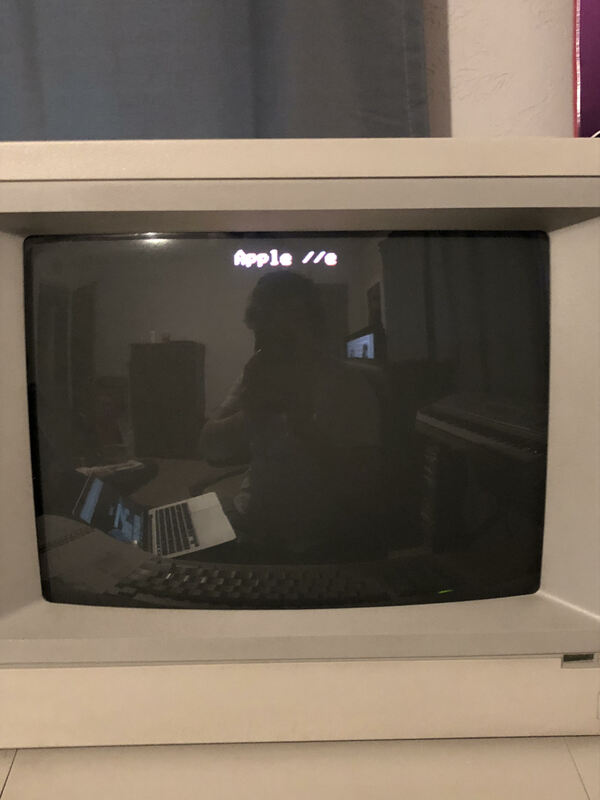 What you are seeing is a normal boot screen for an Apple //e when there is no bootable disk in the disk drive. * insert a bootable disk into the attached disk drive (I assume that there is one?). If you do not have a disk drive, your options are very limited and I would suggest that you get one. The fact that the dealer loaded up a program seems to indicate that the machine came with a disk drive however? If you have Disk drive check here for thread about term "ADT" or "ADTpro"
If you don't have a disk drive, I agree you should get one. But in the mean time, all is not lost. You can still use your //e, and play games on it through the cassette ports between the video, and joystick ports on the back of your machine, opposite the power (the one closest to the joystick port is the input). Using a standard aux cable, connect the cassette input on your //e to the audio out, or headphone jack on a mac, pc, tablet, or smart phone, and set your volume to max. Then go to http://asciiexpress.net, and click games (use mobile version if you're using a smart phone, or tablet). Turn on your //e, and press Control-Reset for a Basic prompt ( ] ), select a game, type LOAD on your //e, and hit Return. Then press play on you other device. The game will run in a when the audio file finishes playing (usually 10-15 seconds). For Assembly prompts ( *) type CALL -151 into Basic, and then follow the instruction on the web sight. Note: some games will not work on a platinum, or enhanced //e due to incompatibilities with the 65C02 processor, and unfortunately Centipede is one of them. I forgot to mention, https://www.brutaldeluxe.fr/projects/cassettes/ is another source I found for cassette based software. The site hosts a number .WAV, and .AIF files for the Apple ][, and even some for the Apple 1. The loading process is pretty much the same as the Game Server, except that you'll have to download the files, and play them from your computer (also it's not that mobile friendly). The selection can be a little hit, or miss for the //e since many of the programs require Integer Basic to run, and the //e only has AppleSoft in ROM. You'll have to check the image of the cassette to know which is which Basically, if it says Load with a ( > ) prompt on the image, then it's Integer, ( ] ) prompts are for AppleSoft. To load anything in Integer, you will need a disk drive, and copy of the language to load into memory (this can usually be acquired from an Apple DOS 3.3, or 3.4 System Master Disk. Also, some are in Assembly Language ( * ), which may be compatible, but you will need the proper loading addresses, and start commands (they differ depending on the program). Usually they're on the cassette image, or under the name of the program on the site, otherwise look for the instructions. If they're posted, you will see a .PDF icon under the disk image on the far right of the site (you might have to scroll). I've personally used this a lot and it works great. Just remember to have the audio at max volume on whatever device you are using to playback the wave file (I personally use an old Samsung Galaxy phone connected to my network over WIFI). So I convert a disk image to a wave file on my main desktop, and then play the wave on my phone directly into the cassette in. It's a little slow - approx 2.5 mins per disk - but not too bad really. There is something really satisfying about doing it this way (to me anyway! ).